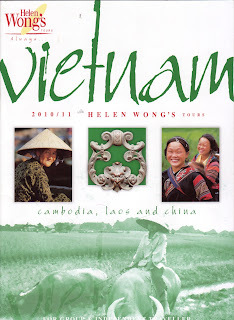 09 March, 2010 - Helen Wong's Tours has launched an expanded Vietnam holiday programme for 2010 / 2011, including a new 11 day highlights tour and a 25-day journey which combines the best of Vietnam with a soft adventure experience through traditional communities of south-west China. The programme also includes a range of "Unparalleled Highlights" which only Helen Wong's Tours includes in tour prices. The new highlights tour, titled "Glimpse of Vietnam", delivers a more affordable option for new visitors to Vietnam. It commences in and around Saigon (Ho Chi Minh City) continuing to the world heritage-listed ancient city of Hoi An, the imperial city of Hue, the capital Hanoi and spectacular Halong Bay, with features including the famous Cu Chi tunnels, constructed and used by Viet Cong fighters during the Vietnam war, the islands of the beautiful Mekong Delta , bustling markets, Hanoi's entrancing water puppet theatre and the mausoleum of Ho Chi Minh. "We first launched highlights tours of Vietnam over a decade ago, when the country was still emerging as a new holiday destination in Asia," said Helen Wong. "Now there's a new generation of visitors to Vietnam, as well as those returning to relive past experiences, so we've reintroduced this programme for them," Ms Wong said. This 11-day tour is priced from $2850 per person, twin share. As well as first time visitors, there are also increasing numbers of travellers seeking to combine Vietnam and China into a single experience, offering not just the key attractions of Vietnam but a journey through China's south west, combining some of the country's most breathtaking natural attractions with the cultures and local customs of minority nationalities. "This tour – the charms of Vietnam and China – takes travellers through the best of Vietnam and then immediately off the beaten track into China's culturally-rich southern and western regions, where visitors can observe and experience the ways of many smaller communities, and where the climate is described as the eternal spring," said Ms Wong. "This is not the new China. From the moment they cross the border on foot, travellers will know they are in an old and traditional China, with localised customs in a range of villages, spectacular terraced rice fields, the 1200 year old Town of Jianshui, the renowned Terracotta Warriors of Xian and the extraordinary Stone Forest of Kunming," she said. "This is an itinerary we believe will appeal to returning visitors, who have seen the big cities and the more widely publicised attractions and are now looking for a more authentic and exotic experience of China." This 25-day programme is priced from $6300 per person, twin share. In addition to the new tours, Helen Wong's Tours adds value with "Unparalleled Highlights" in Saigon, Hoi An, Hue, Hanoi, and Siem Reap, including a dinner at Saigon's Le Caprice French colonial restaurant, and cocktail reception at the Sheraton Hotel's "Floor 23"; dressing in traditional costume and enjoying a themed "Emperor's Dinner" in Hue; Lunch at KOTO Restaurant in Hanoi, plus a cooking class at the renowned Sofitel Metropole Hotel Cooking School and lunch at the Spice Garden Restaurant; and, in Siem Reap, a 10 minute tethered hot air balloon ride for a spectacular view of Angkor Wat, plus welcome drink at McDermott Gallery and dinner at the Foreign Correspondents Club.